Orthotics – external braces that support the spine or limbs – are expensive and the process of having them made to size and fitted to a patient can be lengthy and uncomfortable. Naveed and Samiya Parvez learnt this the hard way with their son Diamo, who had cerebral palsy and was quadriplegic. Diamo had to have his orthotic device moulded to the shape of his body using plaster of Paris, a process which he found highly distressing, as cold, wet things upset him and his parents were unable to explain what was happening. Every few years when he outgrew the old orthotics he would have to repeat the process. Sadly, Diamo passed away in 2012, but his parents are now working to improve orthotics for other young people with disabilities and their families. 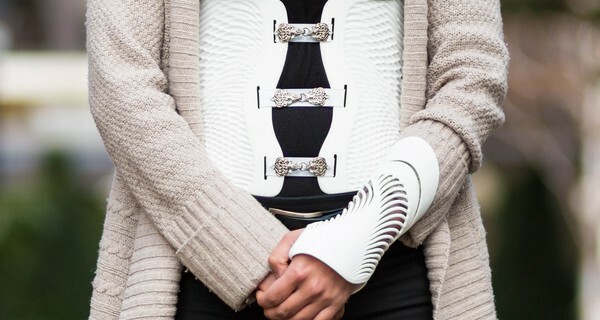 Andiamo 3D-scans patients and 3D-prints orthotic devices made to measure. Using the scan of the patient’s body, a biomechanical model is built, and the orthotic device is fitted and tested with the model as a mannequin. 3D-printing reduces the manufacture time significantly: the parts can be made in 48 hours and the finished brace is ready for fitting in a week, compared to the 13 weeks some patients currently have to wait. The digital techniques mean Andiamo will be able to collect and upload information on each device made and each patient measured, allowing them to improve their designs and create orthotics that are absolutely bespoke. They will also use the information and insight they gain to build the first dataset on orthotics for clinicians. If you know a child who could benefit from Andiamo’s 3D-printed braces and want to sign up to be part of the pilot, contact the team via their website http://andiamo.io.